Product #18713 | SKU MT190X3 | 0.0 (no ratings yet) Thanks for your rating! 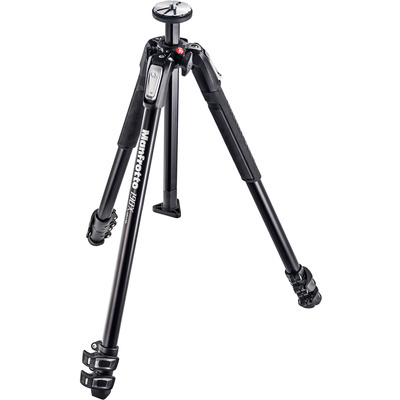 The Manfrotto MT190X3 Aluminum Tripod is an addition to the popular 190 series, adding a Quick Power Lock System, ground level adapter, and an Easy Link attachment. It can hold up to 7 kg of gear, and has a maximum height of 160 cm. The ground-level adapter replaces the center column to allow the tripod's mounting plate to sit just 9 cm above the ground with the legs at their widest angle. The QPL system allows the three leg sections to be completely extended with one hand for simple set up. An Easy Link adapter attachment allows instant connection between tripod and accessories, such as LED lights for macro photography and DSLR video applications using Manfrotto articulated arms and brackets. Each leg can be set at four different angles to accommodate uneven ground or rough terrain.